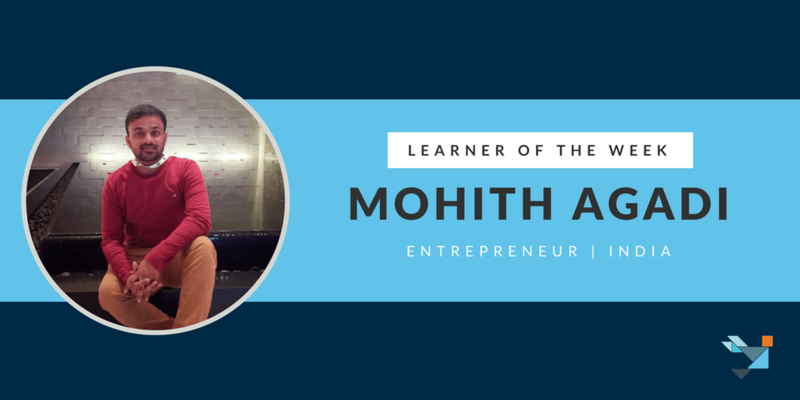 As part of our Learner of the Week series, we sat down with Mohith Agadi, a digital marketing specialist, entrepreneur, author, and philanthropist who will represent India at the 20th session of the Youth Assembly at the United Nations. I am from Anantapur (Anantapuramu), which is a city in Andhra Pradesh state of India. There are many, but there is this particular one. At school, they made students of different grades sit together to avoid cheating. During one computer exam, the invigilator gave me the question paper of a higher grade. Silly as I am; I didn’t notice that this is not the paper of my grade and started answering right away. And I was even able to complete it. This made me realize how much interest I had in computers. Later, this interest inclined toward digital marketing. Well, now here I am. I worked as a digital marketing specialist at various firms in various verticals, before I resigned my job and founded my own digital media and marketing firm, “Wectonic”. Recently, I co-founded Staunchus, LLC,—a U.S.-based e-commerce company. What would your dream job look like? Having my own company has always been one of my biggest dreams. Now that I am living it, I have realized that this is a battlefield and I have to be a persistent learner. Why did you decide to start the Digital Marketing specialization? The digital marketing industry is an ever growing field and there is a huge competition. I enrolled for Illinois’s digital marketing specialization because I want to keep up with it. Like I mentioned before, one needs to learn continuously, plus, I have to mentor my colleagues. I had done a research beforehand on various digital market programs available, but I found this to be the best among all. What has been the most interesting thing you’ve learned in the course you are on? Currently, I am pursuing the first course: marketing in a digital world. It has shown me digital marketing from a marketing perspective. I am really happy that I have got an opportunity to learn marketing basics along with digital marketing. Have you gotten a chance to apply Digital Marketing concepts in your daily life? Not yet, but I am sure that once I finish my courses, I will have some great ideas and insights to help my organization build better products and offer better services. How do you plan your schedule to make time for Digital Marketing courses? I have made a commitment that I’ll set aside at least 2 hours on all weekdays for the course work. Do you have any advice for new learners or for those who may be unsure about starting the specialization? Sure, for all those new learners out there and also who are still in decision-making process, I can say one thing, that is “not just learn great things, but also try to practice”, because in any field or industry theoretical learning will not last for long unless it is practiced and implemented. Email us at cobcourserastaff@gmail.com to be featured as the next Learner of the Week. Click for more information on how you can take free, online courses in Digital Marketing from University of Illinois at Urbana-Champaign professors. Glad that you found the 1st course interesting like myself. Reading recommended materials is also full of relevant knowledge. I am currently enrolled in Digital Marketing Capstone the final course of the Digital Marketing Specialization. I am sure you will find later series of digital marketing courses highly knowledgeable as well. All the best and Happy Learning! Smart kid, finishing a higher grade paper :). You are right; as Ryan Holiday says in ‘Ego is the Enemy’ when you arrive at success, you realize it is just a lot more responsibility, and you have to acquire new skill-sets to maintain and grow it. Good luck with your ventures! Great job Mohith Agadi with your exceptional dynamism shown in the field you have chosen. Since from childhood i am almighty of yours and i can say ” pendulum swings between extreme pesimissm and imperialistic optimism”. I am glad that pendulum is in your backyard I.e optimism.#GOOO and ACHIEVE whats left. 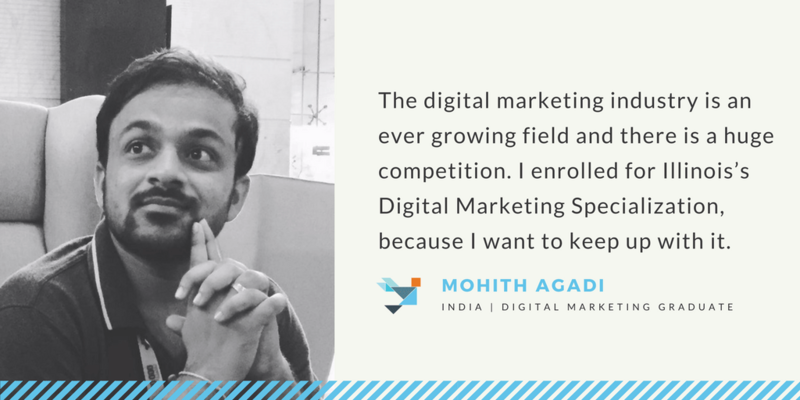 Great job Mohith Agadi with your exceptional dynamism shown in the field you have chosen. Since from childhood i am almighty of yours and i can say ” pendulum swings between extreme pesimissm and imperialistic optimism”. I am glad that pendulum is in your backyard I.e optimism.#GOOO and ACHIEVE whats left.